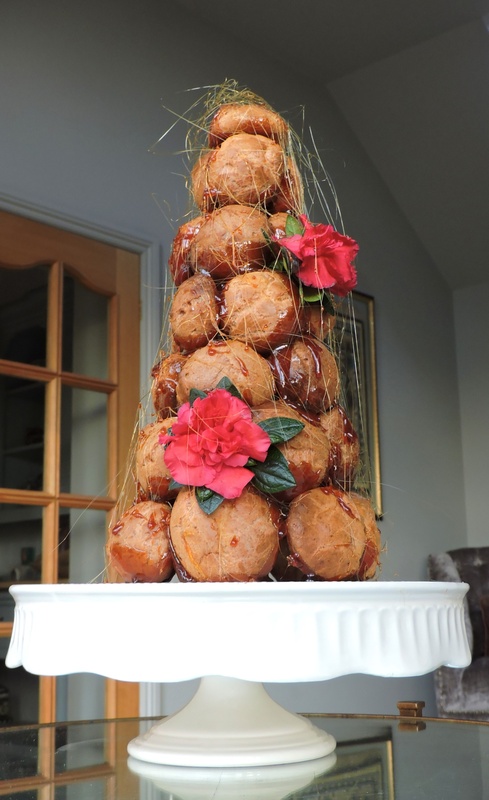 Croquembouche… Literally ‘crunch in the mouth’. Also known as a French Wedding Cake. It’s made from profiteroles that have been stacked around a cone and held together with caramel. It can be quite fiddly but I enjoyed making it. The profiteroles are filled with a white chocolate chantilly cream. I used my choux party recipe from the salted caramel éclairs a few weeks ago. It worked very well, I put it down to the strong bread flour and high salt content. Make sure your filling errs on the sweet side to counteract the shells. I thought I’d need loaaaads of profiteroles so I doubled the recipe… Yeah, definitely didn’t need that much. A significant proportion went in the freezer after baking and the rest are sitting in the fridge a bit lonely. I sustain some form of burn 9/10 times when I work with sugar and this was one of those times… Be very careful – molten sugar is soooo hot and now I have some horrible looking burn on my hand. Ironically it’s not even from when I was dipping the profiteroles in sugar but from when I was clearing up! Pre-heat the oven to 180°FAN. Line two baking trays with parchment paper and make the choux pastry. Pipe small rounds of choux pastry on to the baking trays leaving about an inch between them. Sprinkle the trays with a splash of water before putting them in the oven and add a roasting tray with about an inch of water to the bottom of the oven. This helps to create steam which rises the profiteroles. Bake for 30-35 minutes until deep golden brown. Remove from oven and make a slit on the underside of the profiterole with a small knife. Turn the oven off and leave the profiteroles in there for another 10 minutes. Now you will need to make a cone. 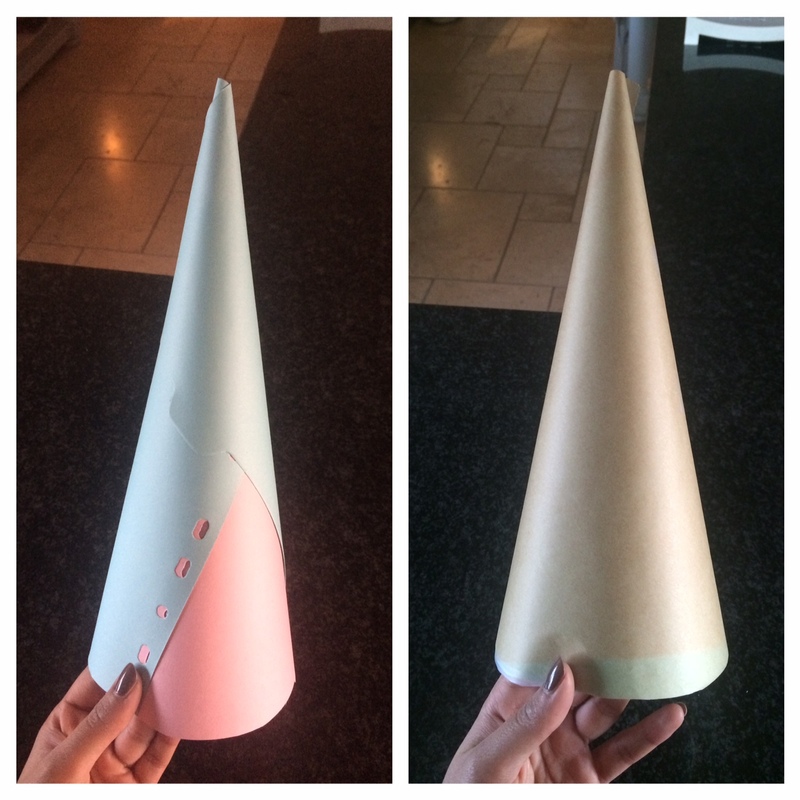 I used some card that was lying around and stuck two A4 pieces together to made a cone shape. Secure it with tape and cover with greaseproof paper or baking parchment. Now that your cone is made, you can start on the filling. Whip the cream in a mixer with the melted chocolate, icing sugar and vanilla until softly whipped. Fill a piping bag with the cream and use a nozzle with a small-medium sized hole. 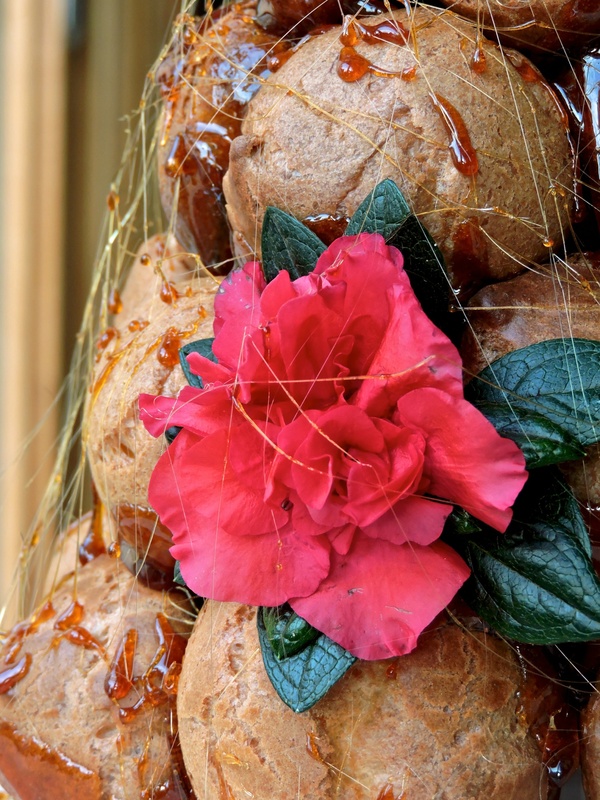 Fill each profiterole with cream and set aside until you are ready to assemble the croquembouche. This would be much quicker with a Bismarck tip and I have noted that for future reference! (Hint hint it’s my birthday soon). To make the caramel, set the sugar in a small saucepan over a medium heat until melted. Do not stir the sugar but swirl it around in the pan to prevent burning. Keep your eye on it… (I foolishly started washing up while my sugar was on the heat, bad idea. Burnt sugar. I started again.) Once it’s molten, remove it from the heat and put it on a chopping board or something sturdy that won’t burn. To assemble the croquembouche, put some gloves on first. That is a must. Any latex disposable gloves will do. Start with the bottom layer around the base of the cone and work your way up, using the caramel as glue to stick the bottom and sides of each profiterole to its neighbour. You will need to keep re-heating the caramel as it tends to set quickly but it should melt up again just fine after a minute or so back on the hob. Now you need to take the cone out. Once the croquembouche structure has set slightly (it doesn’t take long) then slowly begin to prise the cone away from the underside of the profiteroles. 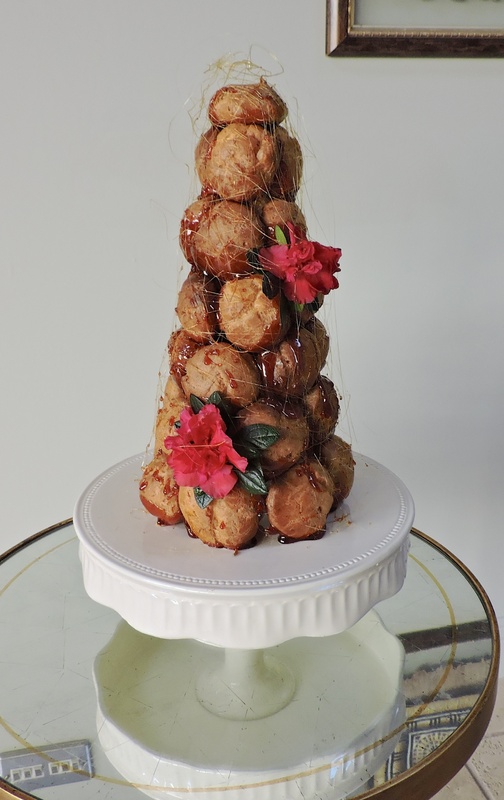 A croquembouche should be hollow and moveable. 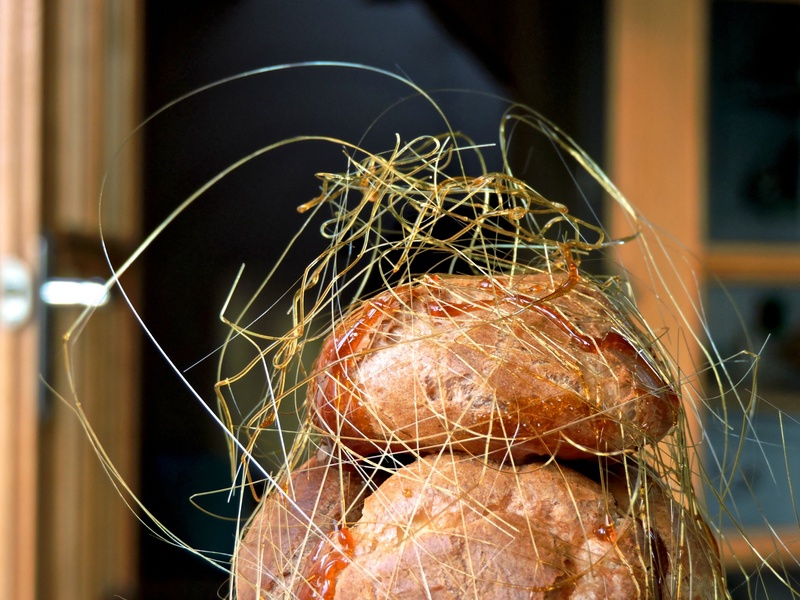 Use the remaining caramel to make spun sugar to go around the croquembouche. I made a lot and by the time I took the photo the thinner strands had disintegrated but oh well. Decorate with anything you like, I used some fresh flowers (from my mum’s plant – she wasn’t impressed but they looked so pretty and I couldn’t resist). Next time, I think I’ll cover each profiterole in chocolate before stacking, and the time after that I’ll make chocolate flavour shells, and oh God I should stop now before I get ahead of myself. BUT in summer it would be delightful with fresh berries. That is all. Start 2015 off with a crunch – it was perfect for New Years with my lovely family and celebrating all our achievements over the past year. Hope you all have a very Happy New Year, and thanks to everyone who reads my blog and keeps up to date with it. I hope to bring you lots of exciting bakes and creations over the next year! I picked up this stuff at Waitrose this morning, it’s finely ground vanilla pods with seeds and all. Amazing! 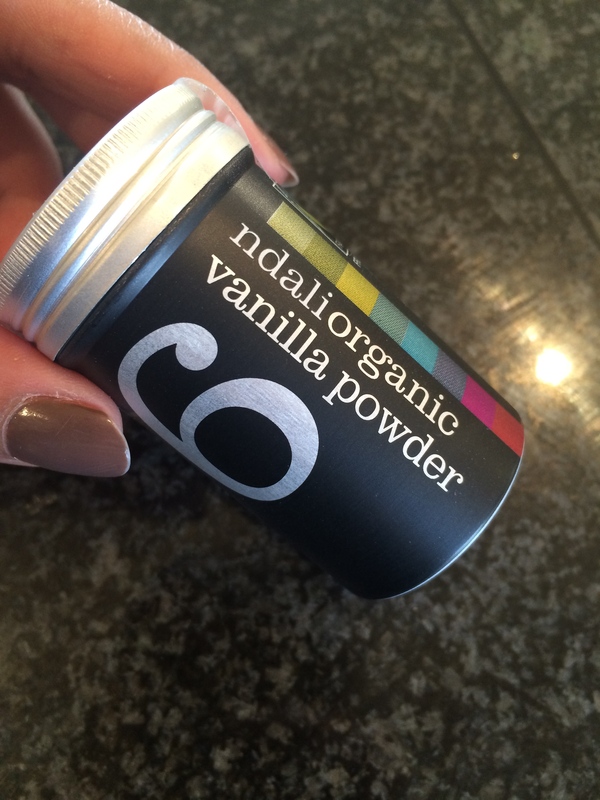 Will come in really useful when adding excess liquid to a recipe is inconvenient but you still need a strong vanilla flavour (hint hint macarons).